What is tongue thrusting in children and how do you prevent it? If a child is having trouble talking and is sticking its tongue out while trying to pronounce certain words, then you may need to see a dentist. Abnormal fronting or “tongue thrusting” is a normal process in children which should stop around age four. 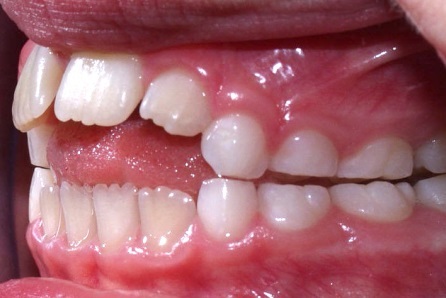 If this action persists after this age then intervention by a dentist is necessary. If caught early enough a dentist can use a tongue thrusting appliance to gently help the child learn to speak properly. Depending on the severity of the case, the dentist may suggest taking it out during the night or simply leaving it in place indefinitely. There are several options available to parents and Jackson Family Dentistry can fit your child with one in as little as two office visits. One particular model has a grid in front of the upper teeth which keep the child’s tongue in place while talking (see figure 1). 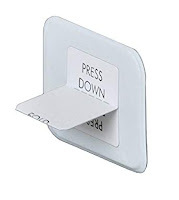 This also doubles as an appliance to break thumb sucking habits as the child will feel the appliance against his thumb and hopefully remember to stop sucking his thumb. In older children, thumb sucking and fronting can cause serious misalignment of their teeth, as it changes the growth patterns in their jaw. The picture below (figure 2) shows how serious the condition can become. 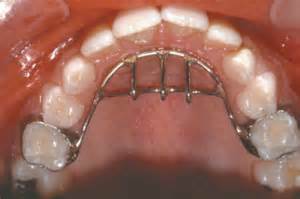 Another option is called a “palatal crib” (see figure 3) which is a device with a small plastic bead attached to a metal bracket. 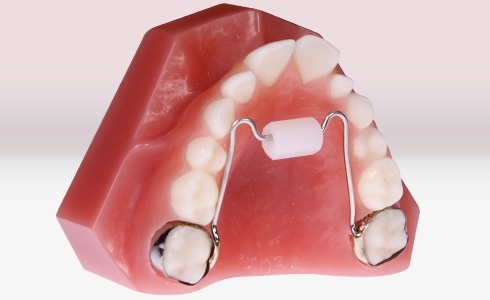 In both devices, the principal concept is to allow the tongue to sweep up. This will aid in both talking and swallowing as the amount of saliva in the child's mouth will be able to be swept away more easily. Also, the tongue will not be able to "thrust" forward, thereby creating a space between the upper and lower teeth. If your child is experiencing any of these habits, feel free to give us a call. Jackson Family Dentistry has over 30 years’ experience in helping children with correcting these habits. Give us a call today and let us help your child’s dental health.